IUSM is the second largest medical school in the United States. The IUSM houses numerous specialized research centers, program project grants and institutes. The specialized research centers include the General Clinical Research Center, the Alcohol Research Center, the Multipurpose Arthritis Center, the Alzheimer’s Disease Center, the Biomechanics and Biomaterials Center, the Diabetes Research and Training Center, and the Wells Center for Pediatric Research. Program project grants include: Mechanism and Therapy of Circulatory Diseases, Neurobiology of the Weaver Mutant Mouse (Parkinsonian disease research), Sexually-Transmitted Diseases, Enzyme-pattern Targeted Cancer Chemotherapy, Genetics and Neurobiology of Alcohol-Seeking Behavior, and Applications of Genetic Therapy. The Krannert Institute of Cardiology, the Regenstrief Institute for Health Care, the Indianapolis Center for Advanced Research, the Institute for Psychiatric Research, and the Walther Oncology Center are other important resources. The Laboratory Animal Resource Center of IUSM received full accreditation by AAALAC, International on its first application in July 1994 and has maintained full accreditation status since then. Founded in 1869, Purdue University is Indiana’s land grant university. Its mission focuses on the discovery, dissemination, preservation and application of knowledge and encompasses the inseparable functions of education, research and service. Purdue offers the only public university programs in Indiana in agriculture, engineering, pharmacy and veterinary medicine. Animal use, in both research and teaching, plays an important role in many of the programs at Purdue. The animal care and use programs at Purdue are diversified as to their administrative structure. Rather than maintaining a central campus-wide administration, this university maintains decentralized management of animal facilities. The School of Pharmacy and the Fort Wayne Branch Campus have been fully accredited by AAALAC, International for over a decade, and in 2004, the entire Purdue Animal Care Program received provisional accreditation. Eli Lilly and Company is a research based corporation that develops, manufactures, and markets innovative pharmaceutical-based human health care solutions as well as products to improve agricultural health and production. The animal care program is part of the Lilly Research Laboratories, headquartered in Indianapolis, IN, with over 6000 employees world-wide. Lilly Corporate Center (LCC) animal use occurs in basic research, human pharmaceutical product discovery, pre-clinical evaluation, and pharmacological testing. The Toxicology Division uses animals primarily for toxicological evaluation of new compounds in development and of intermediate products of manufacturing. Animal Science Research (Elanco Animal Health) uses animals in discovery and product development primarily in the areas of agricultural animal health, nutrition, and physiology. 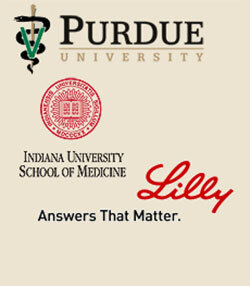 Eli Lilly and Company was first accredited by AAALAC, International in 1967 and maintains full accreditation status.